Learn How to Live a Joyful Spirit-Led Life! Are you enjoying every day of your life? Or do you tell yourself and others that you will find happiness once you have reached a specific goal or position in life? Jesus came so that we might have and enjoy life (John 10:10). Joy is a fruit of the Spirit. If you have not been enjoying your life to the fullest, it is time to begin! In this book, Joyce Meyer combines biblical principles with personal experiences for a powerful teaching on how to enjoy every day on your journey through life. By applying the principles outlined in this book, you will learn: * How to make the decision to enjoy life * How to rid yourself of regret and dread * How to experience the simplicity of life * How to find joy during times of waiting * How to finish your course with joy * Plus much more! Enjoying life is not based on enjoyable circumstances. It is an attitude of your heart. 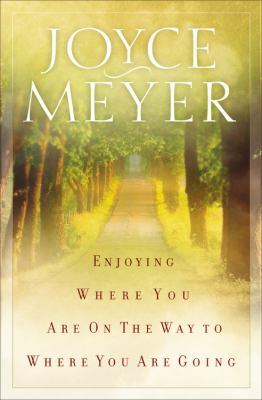 So learn how to enjoy where you are on the way to where you are going today!Meyer, Joyce is the author of 'Enjoying Where You Are on the Way to Where You Are Going Learning How to Live a Joyful, Spirit-Led Life' with ISBN 9780446691048 and ISBN 0446691046.